We’ve been big fans of Kavalan since it first made an appearance on our shores in 2011, so much so that we spent a year to be the first to stock its whiskies in the UK, and it has been winning awards ever since. 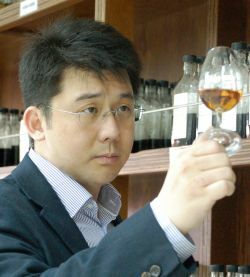 We welcomed Ian Chang, Kavalan’s master blender to TWE for our latest tasting to find out more about the major player of Taiwanese whisky. Kavalan Classic – the flagship of the range, this has the distillery’s classic notes of mango, green apple, vanilla and coconut. 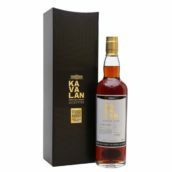 Kavalan Concertmaster – finished in ruby-port casks, this has notes of dark chocolate and blackberries. King Car Conductor – similar recipe to the Classic, but with more use of sherry casks adding extra dried-fruit flavours. Kavalan Solist Bourbon – luscious and rich with lots of vanilla and coconut notes. Kavalan Solist Sherry – thick texture with an abundance of treacle and raisins. Kavalan Solist Vinho – aged in re-charred wine casks; creamy and fruity with a hint of spice – a masterpiece. Kavalan Solist Moscatel – available later this year; fruity and floral with notes of honey, lychee and rose. All of the whiskies are very different, yet maintain the fruity house style, with varying degrees of warmth and complexity. 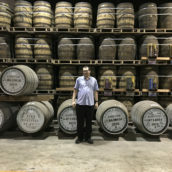 Each has its own time and place for enjoyment, and on the evening it was the original – Kavalan Classic, a great introduction to the distillery and the whisky that highlights the quality of the range. Nose: Very fruity – predominantly mango and apple, with an abundance of vanilla and coconut, too. Palate: This displays the classic distillery character with notes of mango, green apple, cherry, vanilla and coconut, held together with a creamy texture. Finish: Medium in length with coconut, butter and a hint of cinnamon. Comment: This was released by the distillery on 4 December 2008, the first whisky to be sold. Aged in a mixture of four types of cask (refill, sherry, bourbon, and one secret), of which 99% is American oak. The recipe adds complexity and lots of vanilla and coconut, and the hot and humid climate allows much more extraction of flavour from the wood, so this tastes mature, despite only being around four years old. It was a pleasure to be led through the range by Ian, who was awarded Master Distiller of the Year and shortlisted for Brand Ambassador of the Year at Whisky Magazine‘s Icons of Whisky awards in 2015. To keep up with growing demand, the distillery is continuing to expand – the original four stills were joined by six more at the start of the year and a further 10 will be operational by August, allowing them to produce nine million litres of alcohol per year (which would put it in Scotland’s top 10). Ian stressed that the new stills will be the same shape as the original pairs, so while volume may be changing, the style and consistency will not. There are a number of new Solist releases due later this year, with the Moscatel joined by Brandy and Amontillado, among others. 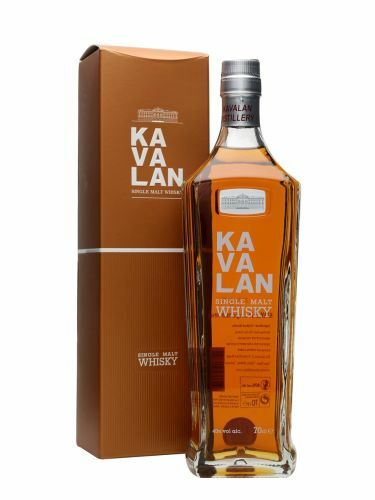 Solist Vinho won World’s Best Single Malt Whisky at the 2015 World Whisky Awards, so if you’ve never tried Taiwanese whisky before, why not pick up a bottle of Kavalan? Gānbēi 幹杯! Five fantastic prize draws – enter today!